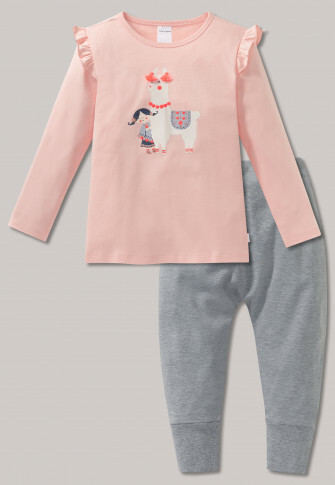 These pajamas capture all girls' heart in no time with their sweet design! The apricot-colored top gets enchanting details with the ruffles on the base of the arm that playfully repeat in the wonderfully pretty motif: A girl and her alpaca ensure a good mood with their glittering accessories in a stylish folklore look. The only thing missing now is the heather gray sarouel pants, 100% cotton and the best SCHIESSER quality, and nothing stands in the way of sweet dreams! from the SCHIESSER line "Alpaka"